John Bollinger developed Bollinger Bands® to measure the volatility of the price relative to previous trades in the 1980’s. Bollinger Bands® ATR: From his Standard Error Bands, the Bollinger Bands ATR was authored by Jon Anderson in Stocks and Commodities Magazine 09/1996. This indicator uses the quotient of the Average True Range, and the Bollinger Band difference, to plot its path. Bollinger Bands® Fib Ratios: Based on the same principles as the standard Bollinger Bands®. The base line is a simple moving average. Bands are calculated using a Wilders Smoothed ATR (see J. Welles Wilder Jr.). Each band is a Fibonacci ratio of the ATR away from the base line. The last article described how to use Bollinger Bands®, very popular price bands developed by John Bollinger in the 1980’s. To review, Bollinger Bands® are derived by taking a simple 20-day moving average and adding a number to get a top band and subtracting a number to get a bottom band. The “number” is 2 standard deviations added to the moving average for the top band and subtracted from the moving average for the bottom band. The way standard deviations work is that 95% of the time, price will fall within 2 standard deviations of a move, which means that when price trades above 2 standard deviations, it will likely come back quickly. This article expands on Bollinger Bands®, by discussing Bollinger Bands® ATR and Bollinger Bands® Fib Ratios, two indicators that enhance the efficiency of the standard bands. 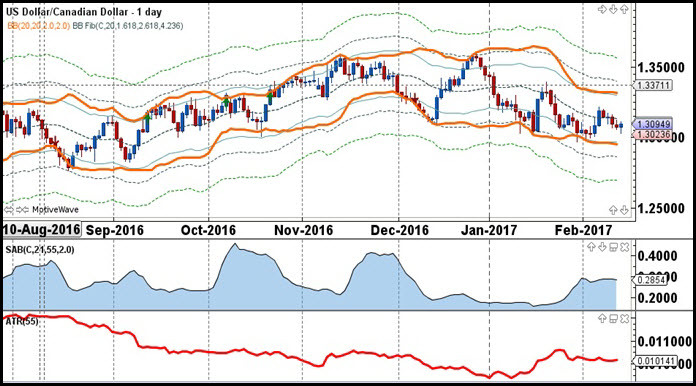 Bollinger Bands® ATR uses the quotient of the Average True Range, and the Bollinger Bands® difference to plot its path. The user may change the inputs but the standard input uses the 55-period ATR and the 21-period BB with 2 standard deviations. In the 4-hour USD/CAD chart below, the 55-period ATR is below the SAB (standard ATR band) to illustrate the calculation. 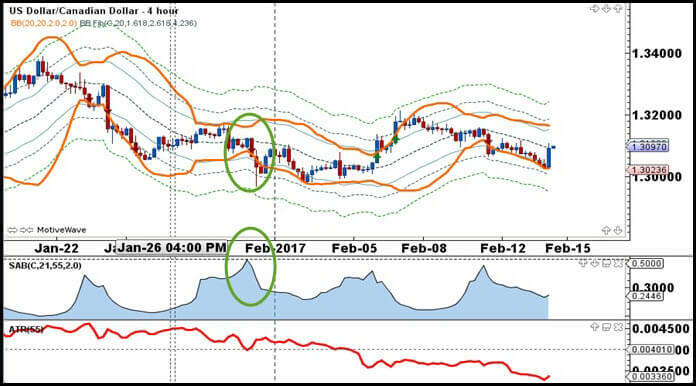 The calculation takes the 55-period ATR and divides it by the Bollinger Bands® difference between the orange bands in the price chart. 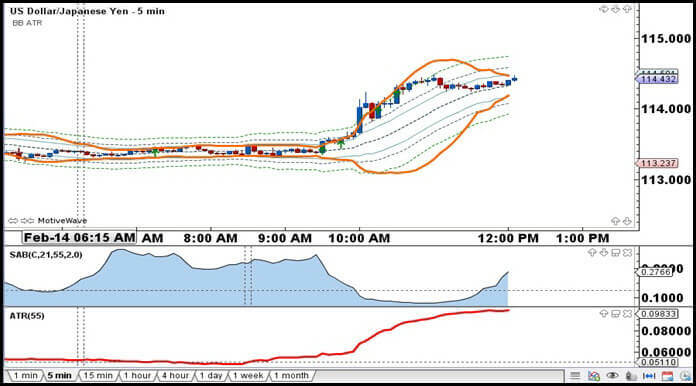 Bollinger Bands® Fib Ratios can be used for visual analysis of price volatility. When combined with other technical analysis methods, the ability to identify volatility can signal a change in trend or an acceleration in the current trend after a period of consolidation. In this calculation, the base line is the 20-period simple moving average (SMA), which presents as the middle band. The 3 upper bands are calculated using a smoothed average true range (ATR) multiplied by a Fibonacci multiple, where R1 = ATR * 1.618; R2 = ATR * 2.618 and R3 = ATR * 4.236. The 3 top Fib lines are plotted by adding R1, R2 and R3 to the SMA. The 3 bottom Fib lines are plotted by subtracting R1, R2 and R3 from the SMA. The orange lines are the standard Bollinger Bands®. Bollinger Bands® ATR and Bollinger Bands® Fib Ratios attempt to answer the following questions: Is the trend strong or is the trend weak? Is the market overbought or is it oversold? Is a trend reversal imminent or is a correction due? Can we look at volatility to identify if a larger move is due? Example #1, in the above USD/CAD 4-hour chart, the SAB highlights when volatility is low, also expressed when the orange Bollinger Bands® are tight. When the SAB ratio is above 50%, this indicates that the market is trading at greater than 50% of the range shown by the Bollinger Bands® and is heads up for tight bands. The bands will begin to expand which is indicative of a trend move or change in direction. The green circles highlight a spike in the SAB to 50% and the accompanying increase in price volatility which causes the bands to widen, as price breaks down in a bearish move. For trading purposes, one might move to a smaller time frame to trade the move down. The closing price on that 4-hour candle is 1.3175 and the market subsequently trades down to a low of 1.3030. At the same time as price drops, the Bollinger Bands® Fib Ratios visually illustrate that price moves almost to the lowest Fib band before the pair turns around. Example #2 below looks at the USD/JPY 5-minute chart. The Bollinger Bands® and fib bands are very tight. The SAB climbs upwards to the 50% mark, indicating to watch for a breakout or breakdown in price action and increase in volatility. As soon as the 5-minute candle closes above the first Fib Ratio band which coincides with a close above the upper BB in orange, take note and follow the price action. This is a day traders dream – to be alerted to the trend and trade the trend long on pullbacks. This market gave several buy signals as price moved from 113.50 to 114.50 within 90 minutes. Learn how Bollinger Bands® ATR and Bollinger Bands® Fib Ratios help define the trends. Start incorporating Bollinger Bands® ATR and Bollinger Bands® Fib Ratios into your chart set-up. Finally, use Bollinger Bands® ATR and Bollinger Bands® Fib Ratios in developing trading strategies. This entry was posted in Trading Tips and tagged day trading, forex trading online, forex trading system, Indicator Toolbox – Bollinger Bands with ATR and Fib Ratios, market analysis, trading, trading plan, trading strategy, trading system.